TRAVEL: The A303 Eastbound is blocked at Stoke sub Hamdon. Three vehicles are believed to have been involved in an accident near the Cartgate Roundabout on the A3088. Traffic is queueing because of the accident. 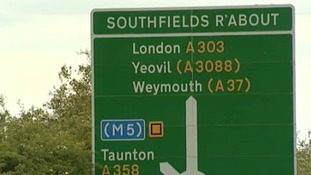 New direction for the A303? It's understood that £2 billion improvements to the A303 and A358 will be announced by the Government next week. 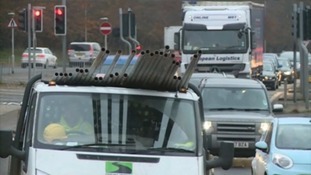 Two billion pounds' worth of new road schemes for the region are due to be announced on Monday, ITV News West Country understands. These are likely to include a tunnel at Stonehenge and making the A358 into dual carriageway - something Yeovil MP David Laws has been campaigning for. "It's totally unacceptable that we've got a road that is so congested for large parts of the year. That's very inconvenient for people in my constituency who travel around parts of Somerset, it's certainly very inconvenient for people who want to travel across the region. It's absurd that when we're investing so much in other parts of the country that the South West has had to wait for so long." Two billion pounds' worth of new road schemes for the region are due to be announced on Monday, ITV News West Country understands. These are likely to include a tunnel at Stonehenge and making the A358 into dual carriageway - something Yeovil MP David Laws has been campaigning for. The Deputy Prime Minister Nick Clegg has been discussing proposals to improve the A303 to the West country at a meeting with business leaders and councillors in Somerset. He gave strong hints that money for the scheme would be announced in the Chancellor of the Exchequer's Autumn Statement next month. I am absolutely determined that we should finally fix this. We haven't crossed the T's and dotted the I's yet on the announcement that will be made in the Autumn Statement in early December but, how can I put it, if there isn't an announcement to improve the A303 in the Autumn Statement, I'll come down here and start tarmacking it myself! 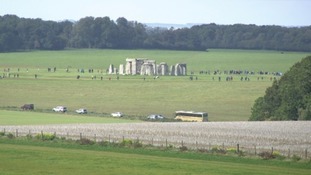 There's been a fresh call for a tunnel on the A303 in Wiltshire to avoid traffic driving past Stonehenge. MPs were told today that the landmark is in danger of being put on UNESCO's "at risk" register because it is so close to a busy trunk road. Today the area's MP, John Glen, used a Parliamentary debate to call for a deep tunnel, similar to one scrapped in 2005, as a permanent solution to the problem. The A303 is closed in both directions between the Hazelgrove Roundabout at Sparkford (A359) and the Podimore Roundabout (A372 / A37) following an accident. Diversions are in operation. The man who died in a collision on the A303 last week has been named. 52 year old Paul Jewkes from North Somerset died after the car he was travelling in collided with a lorry on the A303 near Ilminster on Thursday 26th September. Police are appealing for any motorists who were travelling along the A303 shortly after 11 o'clock that morning to get in touch. The driver of the lorry has been arrested and released on bail on suspicion of dangerous driving. The driver of a lorry involved in a multi-vehicle crash on the A303 in Ilminster on Thursday has been arrested in connection with the fatal collision. Could the A358 in Somerset be dualled at last?